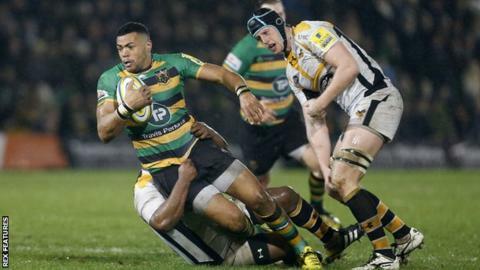 Northampton and England centre Luther Burrell says teams are wising up about how to defend against him. He only has two league tries this term and is not in the Six Nations squad. "I've got to be positive because people outside the group have been expecting me to be a world-beater, but it doesn't happen like that because teams are becoming smarter," said Burrell, 28. "They know if they give me time and space I'm going to take it and that's when I'm at my best." He continued to BBC Radio Northampton: "You see teams in their defensive set up against us putting a flanker in the backline to try to slow the first breakdown and stop me at source - we need to adapt as a backline." Burrell, capped 12 times by England, was not chosen by former England head coach Stuart Lancaster for the 2015 World Cup behind Sam Burgess as the host nation went out at the group stage. The former Sale player said he felt down by Lancaster, and revealed he had spoken with new England boss Eddie Jones. Burrell said he was "his own worst critic" and always put pressure on himself, and added Jones had agreed he was a confidence player. "I'm sure my confidence will come back," said Burrell. "I want to hit the ball after the first line-out and get into the game early because that's when I'm at my best. "It's when I'm not touching the ball for 25-30 minutes when I've got to try to do something out of the ordinary to get myself involved in the game which is when little errors start creeping in. "You're forcing the ball, doing things out of character - at the weekend we had a turnover ball late in the second half and I threw it on the floor. "It's the little things like that that really start to get on top of you a bit because it's just out of character."